Backdrop of drama series is at a fictions school which sends many students to Tokyo University every year. Aoshi (Kazunari Ninomiya) is a new teacher. He becomes the baseball coach for the school. The baseball team has only 5 players and has never won since the team began. Aoshi and his players make a goal to win the Japan High School Baseball Championship. Based on novel "Yowakutemo Katemasu" by Hidemine Takahashi (published September 28, 2012 by Shinchosha Publishing Co, Ltd.). Ren May 31 2017 5:39 am This dorama is so-so. Tbh, I started watching because of Sota and it is enjoyable somewhat. All the cast really did a good job especially Nino.If your into sports dorama go watch it, and if you come only for the ikemen then go watch it as well kkkkkk. Kae May 14 2017 2:00 am This drama is so good. OMG! Kanata, Yuto, Kento, Sota, Dori and the whole cast is just mmmmmmmm ??? JoanaMagundayao Dec 28 2015 12:35 am My Gooooooodddd! >.< Kento Yamazaki and Yuto Nakajima!!! Again in One Movie? great ! I've been watch them at Suikyu Yankisu (Water Polo Yankees) and they are good actors! Daychan Aug 04 2015 9:17 am Nino is really suited for this kind of role. Amazingly amazing as expected. jerujeru Mar 31 2014 7:55 am Excited for this! 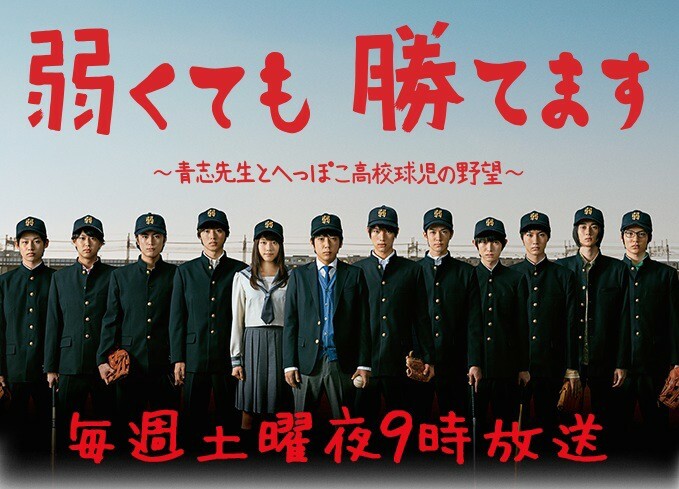 All the best j-actors I know are here >< So cooool~ <3 Nino, Yuto, Kento, Kanata, Shotaro, Dori, Sota, Shuntaro~ omg! and also Kasumi~ This is going to be one interesting drama..
anne filart Mar 31 2014 6:21 am I can't wait to watch this. My 5 favorite actor for one drama Kazunari Ninomiya of Arashi, Sota Fukushi of Kamen Rider Fourze, Yuto Nakajima of Hey Say Jump, Dori Sakurada of Kamen Rider Den O and Prince of Tennis Musical and Kanata Hongo of Prince of Tennis Live Action. Yes I am very excited, I can't wait!!!! Arissa Feb 27 2014 12:03 am OMG IM ABOUT TO DIE!! 3 FAV ACTORS IN ONE DRAMA!! KYYAAA~ Now I will keep track and watch this drama! sha Feb 25 2014 5:20 am oh my gosh.. awesomeness!! Nakajima Yuto, Ninomiya Kazunari, Kanata Hongo, Suzuki Katsuhiro.. my fav actors in one drama... heaven! I also do like Kasumi Arimura.. Really excited for this! fannssu Feb 25 2014 4:37 am i just can't believe it, both of them are my favorite idols, its nakajima yuto and hongo kanata, i mean, of course. i just can't wait to watch this drama, aaaaakkk whatta!! Eiriin Feb 24 2014 10:31 am deym can't wait to watch .